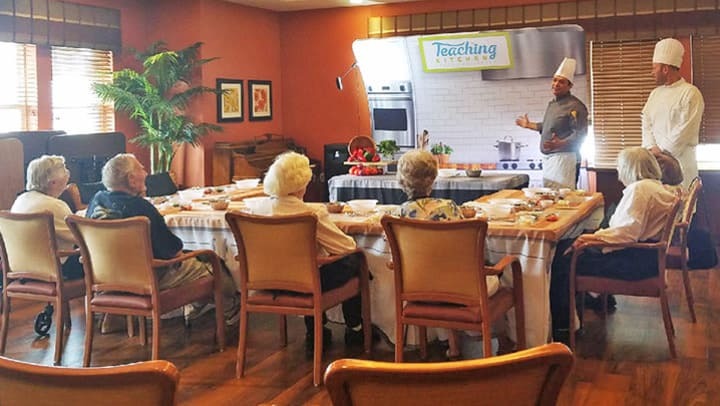 Executive Chef Marco Valadez and Regional Executive Chef James Kleiber captivated the attention of Clermont Park Residents during their exciting and inspiring "Teaching Kitchen" Demonstration. The community room was transformed into our Teaching Kitchen, and residents commented that they felt like they were in a television cooking show. Each workstation was provided with a recipe, an apron, bowls, stirring utensils, and even a cutting board placemat. Chef Marco began the demonstration by encouraging residents to totally immerse themselves in the “kitchen experience” as he described kitchen culture and setting yourself up for success. First, residents smelled and described each ingredient in front of them. Residents were quick to respond on which ingredient each item was. After all ingredients were discussed thoroughly, including a brief history of certain ingredients, Chef Marco described the cold barley salad recipe the participants were going to be making together. Residents were very involved and engaged in each step of the preparation process - even answering Chef Marco’s questions with the answer “Yes, Chef!” with a smile on their faces. During the demonstration, residents were telling stories on their favorite recipes and earliest memories of cooking. Clermont Park Residents learned more about the healthy and delicious meals they enjoy. They are still talking about their great experience and cannot wait for the next teaching kitchen at Clermont Park!